Foot pegs are possibly the most over looked parts on a bike but one of the most important parts. No matter how much power your bike makes, it means nothing if there is no control of the bike . 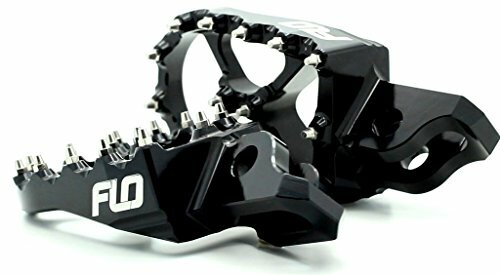 You probably haven't given much consideration to you're footpegs before, but pretty much all professional AMA supercross , motorcross and off-road riders ride with aftermarket footpegs for a wider platform, more grip and overall control of the bike . 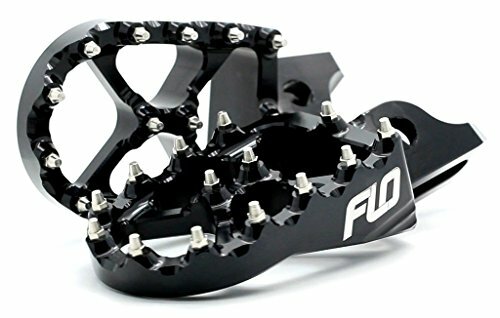 Our Pro series Flo Motorsports Foot pegs will offer all of the above plus some more.We put them through some of the harshest testing and terrain on some of the top pros bikes in the world.with nothing but positive feed back from riders like Matt Lemoine , Billy Laninovich, Cooper Abbot just to name a few . Our pegs are constructed from highly durable 7075 T6 alloy making them much more durable then some standard 6061 T 6 that many competitors use on the market. If you have any questions about this product by Flo Motorsports, contact us by completing and submitting the form below. If you are looking for a specif part number, please include it with your message.